A brand new analysis of more than 100 studies and academic journals, combined with feedback from thousands of people across the country has celled into question the way many LGBT Americans think and feel about whats going on within the community at the moment and brings new housing and employment information to light. The project called Our Tomorrow, and will provide 125 nonprofit foundations and other partner groups with new data to better engage lesbian, gay, bisexual, transgender community and hopefully show a better path to whats needed to be done as far as the issues that effect us and need to be worked on most. 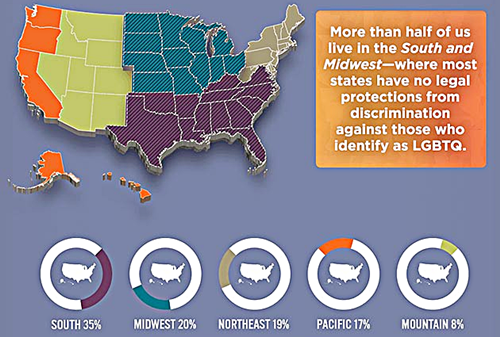 So far, the researchers has revealed that more than half of the American LGBT community lives in the South and Midwest, where they have no legal protections from discrimination in housing, employment, or accommodation. Which runs contrary to the notion that many LGBT’s already have protections because of the higher concentrations of the community in big cities and in the more progressive states. Another part of the project focuses on The “hopes, fears, and ideas” of our community and shockingly shows that only 18 percent of the LGBT community describe themselves as “very happy” compared to 30 percent of the general public. By canvassing at Pride and other events in 40 cities this summer, survey organizer Hattaway Communications has already culled 6,000 submissions, and welcomes more. You can share your thoughts, ideas and opinions through its website — shareourtomorrow.org — through August 17.